Back office areas within VRS is where your management team and supervisors control how your business runs. Using advanced management tools VRS allows you to make rapid changes to core data within the system, reacting to market changes so that your airline is positioned where it need to be. Flight Schedules, Inventory Levels, Fare Pricing, Service Fees, Ancillary Sales, User Management and much more - all fully managed and controlled using state-of-the-art interfaces in real time. Everything in VRS is designed to be simple and intuitive. Of course, making a very sophisticated system easy to use requires some seriously advanced interfaces and VRS provides airline management teams with amazing tools to run your business. From flight schedules to fare pricing, creating and adjusting your data couldn't be easier. Search by date ranges, fliter by classes, update bulk data all using our latest interface technology to make your life easy. The back office interfaces give you access to all data in real time meaning that when you want to make changes they are effective immediately not only for internal use but to the outside world including GDS networks and interline partners. When you sign up with Videcom we provide your with a dedicated system just for your airline providing you with the flexiblity to operate just that way you want to. All the data within the system is solely for your airline so set up and configuration is made during the training and consultation period to ensure the system behaves and functions as required. Other Airlines Codes, GDS Codes, Countries, Cities, Currencies, Times Zones, Aircraft Types, Airport taxes. All set up and managed in the way you need it. Single Seat Maps are used across the system (Reservations, Online and Departure Control) to ensure that duplications do not occur and offers real time seat allocation to all users. The VRS Fares engine provides advanced processing for fare pricing, rapidly offering users with accurate fare quotes. A super-fast fares engine giving rapid results for an intensive operation. The VRS Fares Engine is fully integrated with all sales interfaces meaning that as soon as you make those critical changes to your prices they are available for all users immediately. No waiting around for other systems or modules to update, VRS takes your business straight to market for instant impact. All fare price data is input and uploaded using a full graphical user interface meaning that its easy for your team to get to grips with managing pricing. Full access is provided to authorized staff from management screens giving you greater efficiency and reduced workload. VRS automated fare quoting follows a intelligent processes to retrieve the most suitable fare results based on the itinerary given. Up to 16 Flight Sectors and 99 Passengers can be priced within each booking with complex interaries and multiple passsenger types. Each interface can be configued to receive the fare quotes in different formats to efficiently display results to the user in friendly and informative layouts. VRS was designed right from the start to give airlines flexibility in the products that they offer. Flexible options at higher prices. Restricted conditions at super value. We give you the freedom to create unlimited catagories to maximize revenues and increase your offering to passengers. Create multiple change fees and apply them to different fare classes dependant on conditions. Use fees to maximize revenue while offering your passengers the flexibility to choose a product most suitable to their travel requirements. Fees are automatically added to a booking when changes are made to flights through any interface from call center, online users and travel agents. The system restricts tickets from being issued prior to payment being made ensuring revenues are collected. As with change fees, cancellation fees can be applied to different fares and with different degrees to penalty based upon the prices paid. If a passenger no shows for a flight or cancels the reservation the cancellation fee will be applied to the booking based on a fixed amount or a percentage of the fare prior to any refeund being provided. This can be up to 100% of the fare price leaving zero balance in the booking in the case of the airline imposing a No Refund policy for that fare class. Collect excess baggage fees in advance of check-in giving your customers an easy way to pay in advance either trhough the call center, travel agent or online. This pre-paid service also ensure that the airline receives 100% of the excess baggage fees rather than relying on airport staff or handling agents to collect funds with the possibility of them being waived. A popular product to sell online is travel insurance. Set this up as a one off cost or charge by the day for the length of stay. An automated report can be sent to the insurance company notifying them each time one of your customers buys this product so that they can fulfil the sale and documentation. Ski equipment, bicycles and golf bags. You can configure an unlimited number of products to sell online and the airport staff can check at anytime each items that has been booked for each flight so that they can be prepared in advance. If you are being handled by a handling agent at any of your airports these products will be included on the PNL sent to the 3rd party Departure Control System so they know what to expect. Excursions can be set up by arrival city so you can offer the relevant content to your passengers based on where they are going. An automated report will be sent to the company providing the excursion so that know who is arriving and on which flight. Each group of users is assinged an office from Call Center, Ticket Offices, Airport Stations, Travel Agencies, Res Control, Revenue Management to Operations and controls are assinged for each office to permit system use. Credit Limits controlling sales, commisions for travel agents and invoicing are all managed based on the office which users are assigned to. An individual profile is set up for each user within an office which is used to control access to different areas of the system, different functions and how the system behaves based on that profile. With 99 levels of security and function controls the system administrator can carefully regulate access and usability for all users. We don't use a 3rd party Eticket database. VRS comes with fully integrated built in Eticketing for all ticketing requirements from all distribution channels - Call Center, Internet Bookings, GDS and Interlines. VRS has a built in IATA compliant eticketing database connected to all the major GDS systems. This allows you to connect immediately to all the systems you want to for interactive ticket sales through IATA bonded travel agents. Ticketed on your own ticket stock number you will receive payments through BSP (Bank Settlement Plan) for all tickets sold through the GDS. Connect to all your Interline Partners using our IATA standard Interline Eticketing connections with all other major airline hosting systems. We provide you with an unlimited number of Bi-lateral connections to other airline systems allowing you to receive bookings from other airlines as well as being able to book other airline segments from VRS. To support different market conditions around the globe VRS supports 3 different types of ticketing time limits and the airline may mix-and-match where they need to. The most basic form is to set a global limit which allows space to be held on flights for a default number of hours before ticketing is required prior to segments auto cancelling. 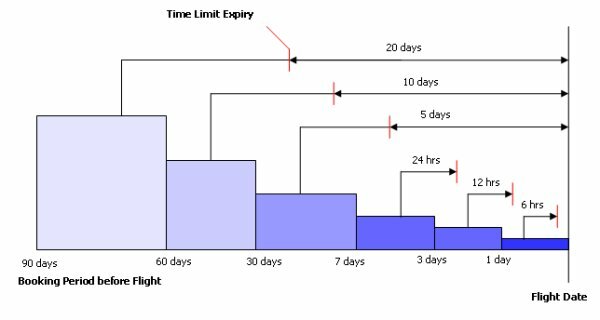 The most widely used option (see example left) is to have varying time limits based on the time period before the flight so that as the flight is reducing in availability space cen be held for a shorter period. Lastly users who are authorized can manually set their own time limits - a function usually reserved for supervisors. Operational staff can use graphical screens to move all passengers or individual passengers from one flight to another in the case of merging or cancelling flights. The operation is very fast and passengers are available immediately on the new flight for further changes or check-in. A modular engine can be enabled which monitors bookings within the system for duplicate reservations. Daily reports are generated and automatically sent to designated staff to process and cancellations required and minimize wasted inventory. Built on a modern flexible platform, VRS allows data to be extracted in any format quickly and easily. With all data held within a single database airlines can pull together information from across an array of different areas and variables to provide reporting to staff and managers exactly the way they like it. With over 200 reports coming as standard covering Admin, Sales, Finance, Res Control, Operations and Management Information its likely that we'll have a report that suites you need out of the box. But with our customer reporting module either airline IT staff or Videcom engineers can quickly modify reports or build entirely new ones within minutes. Flexible export mechanisms allow us to cutom build data files to provide automated transfer of sales data to your revenue accounting system. We have dozens of different formats already built in that can eiether be used off the shelf to most RA systems or can be adapted to suite yoru needs. BSP HOT files are a standard element delivered with our system.